New! Remote administration from other computers in the local network without installing the Dr.Web Control Center. 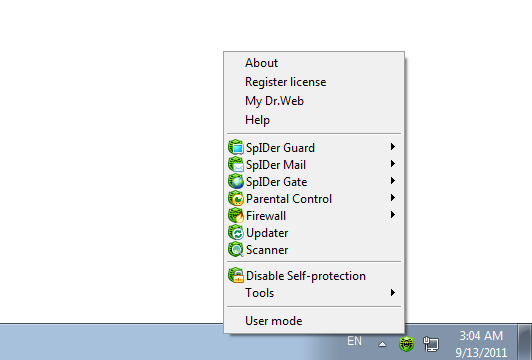 Dr.Web SelfPROtect restricts access to a network, files and folders, certain branches of the Windows Registry and removable data-storage devices on the system driver level and protects the software from viruses aiming to disrupt the operation of Dr.Web. Neutralizes viruses, Trojan horses and other malware. Real-time filtering of incoming and outgoing e-mail. The anti-spam doesn’t depend on a mail client and doesn’t cause receipt delays. The anti-spam doesn’t require configuration and starts working as soon as the first message is received. Different filtering technologies ensure the high probability of detecting spam, phishing, pharming, scamming and bounce-messages. Anti-botnet – you won’t be disconnected from the Internet because your computer sends out spam. Messages that have been filtered out are never deleted. Instead they are placed in a separate folder where you can always verify that no false detection has occurred. The standalone anti-spam analyzer module doesn’t require connection to an external server or access to a database, saving on traffic. Plug-ins allow you to check web pages before opening them, warn you upon opening external links on Facebook and Google + and check these links, recognize and check short URLs, scans files to download from the Internet for viruses, checks links to scripts and frames. The SpIDer Gate™ module scans incoming and outgoing HTTP traffic in real time, intercepts all HTTP connections, performs data filtering, blocks infected web-pages in any browser, scans files in archives and protects users from phishing sites and other dangerous web-resources. New! Scan encrypted SSL-connections (HTTPS). New! Block access to sites according to the virus databases and warn the user about untrustworthy sites. You can disable checking outgoing or incoming traffic, as well as compile a list of applications whose HTTP-traffic will be scanned in any case (blacklist). You can also define applications whose traffic will not be scanned (whitelist). Adjust traffic scanning priority which will affect the utilized amount of CPU resources and web-surfing speed. Filtering doesn’t affect the overall system performance, surfing speed or traffic. Block of access to web-sites from the list divided into 10 subject groups (Adult content, violence, weapons, drugs, gambling, etc.). Block of access to removable data storage devices, files, folders or network drives – an additional measure to protect data from deletion or unauthorized access. 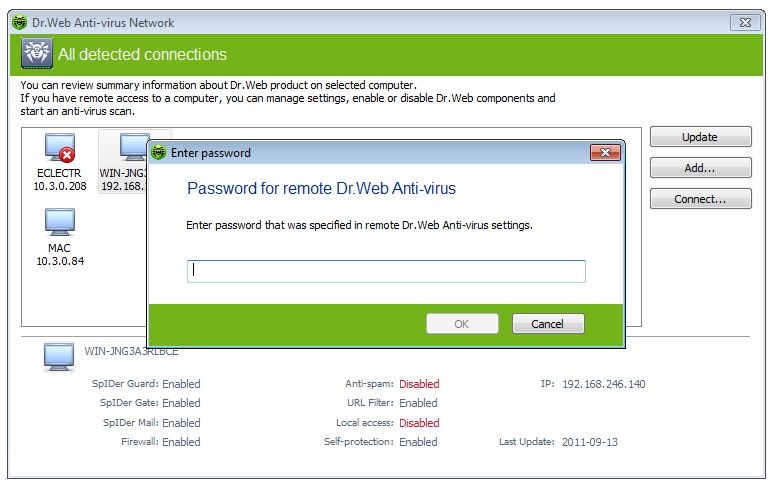 The Anti-virus network component enables remote administration and configuration of Dr.Web software installed on computers in the local network. 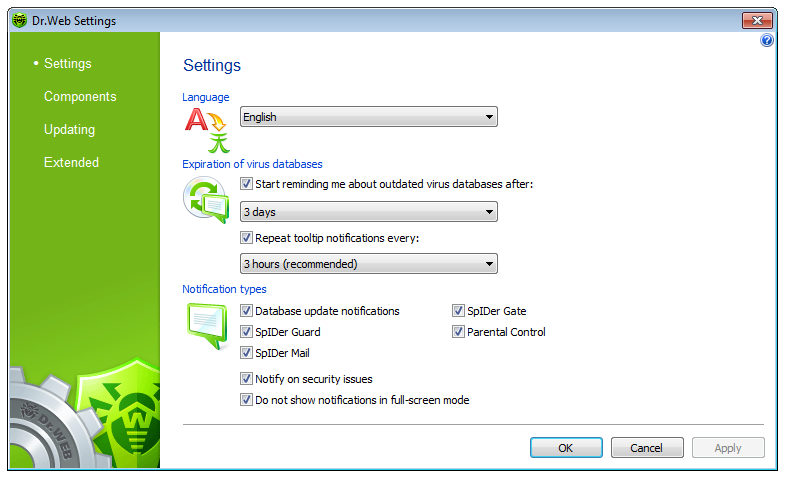 The administration includes retrieval of statistics and logs from a remote machine, viewing and changing modules settings and starting and stopping anti-virus components. You can also register a serial number and replace a key file on a remote computer. Isolating suspicious files, that may contain malicious objects in the quarantine. A separate folder is created on each logical disk on which suspicious objects have been detected including removable writable data storage devices. Isolated objects can be sent to Doctor Web's virus laboratory for analysis. You can limit the quarantine folder size. A back-up is created automatically whenever an infected file is quarantined, cured or deleted. Even if files are stored in the quarantine indefinitely, their backups are stored temporarily (while there is free disk space). 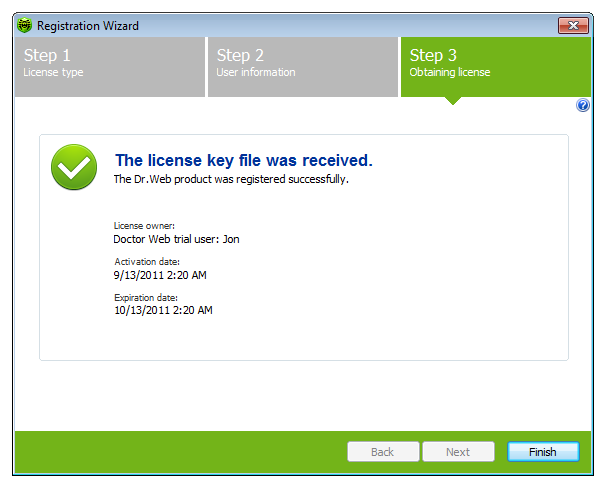 The License Manager displays information about available Dr.Web key files. Free disk space: ~ 450 MB. Temporary Files created during installation will require additional disk space. Additional 11MB are required to install the firewall.